One of Europe’s greatest assets is a diverse pool of bright, well educated talent. Every year, hundreds of incredibly talented men and women graduate from top European universities. Many more immigrate here from other countries. Yet startup founders and hiring managers often say they can’t hire fast enough to keep up with their growth. Well, for starters, a review of the employment data from leading universities reveals many of the top graduates in Europe end up in finance, management consulting, or corporate jobs. This is no surprise considering that these companies are ever present on campuses with a proactive approach to recruiting the top graduates. They get to the best students early and sell them on the great learning opportunities they can provide. Plus, they have strong brands and can offer attractive compensation packages. Moreover, the tech ecosystem in Europe is younger, scrappier, and more humble. There are fewer legendary companies and fewer stories of startup employees experiencing life altering success. One result of which is that there is less of a bandwagon effect. In San Francisco, all your friends work in tech. You can’t go a month without hearing about a friend of a friend who has exited and cashed out their equity or see someone you know featured in Techcrunch for some ‘disruptive’ innovation. These are not reasons people join a startup, but they create a positive feedback loop. 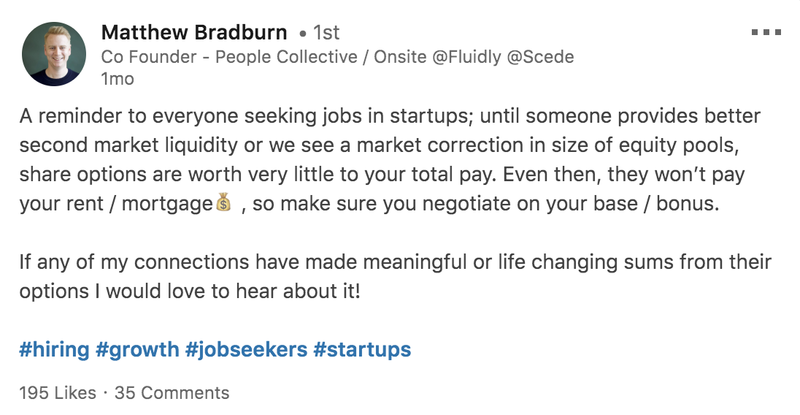 So when a fresh graduate is deciding between a shiny offer from McKinsey and one with half the cash and some nominal equity in a tiny startup sharing a co-working space in SoMa, he is tempted to take the latter offer. That is not the case in Europe. Though they may offer the same incredible learning opportunities and growth potential, startups here have less employer appeal. This is partly because Europe is a less tech saturated ecosystem but it is also partly due to what Dan Hynes calls a smart hiring shortage, “founders, CEOs and CTOs constantly underestimate how time-consuming and difficult it is to hire an amazing team” he explains. We are working to address this both by providing guidance on equity and by creating secondary market liquidity through our new fund. But this is not a problem that will go away overnight so it makes sense to focus on what we can do better to attract the best talent now. In other words, focus on finding and developing talent magnets. Working in executive search in San Francisco, I had the privilege of meeting many exceptional tech leaders. One of the most important skills they brought to their companies was knowing how to attract talent and scale teams quickly, while maintaining a high bar. They had a kind of hypergrowth muscle memory that came from having hired and managed teams under pressure. We called them talent magnets. In Europe, there aren’t yet as many tech startups that have reached the massive scale of Silicon Valley companies. So we have fewer managers who have experienced growing from 50 people to 5,000 in a few short years. Although this is true in every function, this experience deficit is more acute in some. In my experience, the toughest roles to fill have been mid-level and senior executives for product, some areas of marketing like growth, and the people function. When these roles remain vacant or get filled with inexperienced individuals, growth slows down — and the impact of this is not always immediately felt. The slow down happens gradually. It’s the first time manager who doesn’t know how to hire well, the high potential young marketer who needs a mentor to develop her, the toxic employee who should have been managed out months ago. It’s death by a thousand cuts. An infusion of scale up experience could be a powerful growth catalyst for European startups. This, of course, is changing. European grown tech giants are already on the rise evidenced by the IPOs of Spotify and Adyen this year. But this change will take time. Bringing leadership talent from around the world, especially from Silicon Valley, to Europe. An infusion of scale up experience could be a powerful growth catalyst for European startups. Why would they come? Because this is an exciting time in Europe and the opportunities for impact are vast. Over the last year, we have gathered a collection of stories and research on this exact question. Read more about why we at Balderton believe now is a great time for Silicon Valley tech talent to join European startups. Entrepreneur turned People advisor to startups at Balderton Capital.